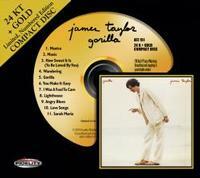 1975's, Gorilla is James Taylor's sixth album and in many ways it showcases his electric, lighter side. Taylor's unique blend of well-crafted songs, meticulous production and heartfelt singing are all in abundance here on Gorilla. Several chart-topping singles came out of the album including "Mexico" and Taylor's take on Motown's "How Sweet It Is (to be loved by you)" thrust the introspective balladeer into the role of hit-making cover artist. The two big Billboard hits from this album shouldn't overshadow some other true classic James Taylor performances and compositions on Gorilla, such as "Music," "Fool to Care," "Lighthouse" and "Wandering" may very well be the most beautiful song ever created. The lush mini-suite "Love Songs" opens with a guitar and clarinet duet and finds James moving ever so discreetly into Gershwin territory. In this period of JT's creativity he was surrounded by a busy and fulfilling musical landscape where Philly Soul, Motown, funk and country rock were all over the charts and radio stations across the nation and he was more then willing to harness all of this into his own signature sound. Gorilla is a beautiful mature album that contains some very good easy listening soft rock music and Taylor is backed up by some of the greatest musicians around, such as Graham Nash, David Crosby, Carly Simon, Randy Newman, David Sanborn, David Grisman, Lowell George and Linda Ronstadt. Audio Fidelity's 24 K compact discs reproduce the ultimate sound of a classic recorded performance without the irregular plated surfaces of standard aluminum discs.